Picture the scene: In a post-holiday food coma world, three guys descend on my house. All musicians, all recording songs in my living room. Yes, songs. A new Beck album of sorts, Song Reader, recently dropped in December 2012. The package features 20 songs — never before recorded or released — as sheet music only. My houseful of music junkies, under the musical direction of the nefarious-sounding but really quite nice Frankie Big Face, decided to record ten songs from this collection…in just two days time! Enter me, the one gal who can make their dinner dreams come true. We needed a meal that was filling, extremely satisfying, and could power future music making. But after a season full of rich, sometimes large, and often heavy meals, it can be nice to dial it back in the dinner department. Lightening up a meal doesn’t mean having to give up on flavor. If the popularity of Meatless Monday is any indication, neither does ditching the meat. Check out some of the music this meal helped feed! 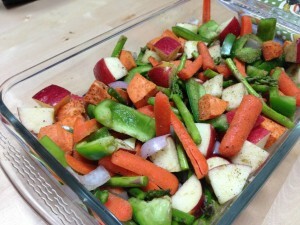 A (not quite metric) ton of vegetables, seasoned and roasted, adds layers of flavor, texture, and fiber (yay colon! 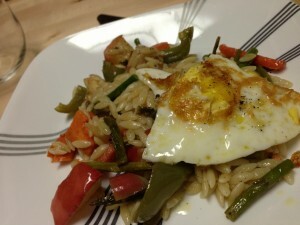 ), especially when sandwiched between other Mediterranean flavors of orzo and an olive oil fried egg. Our dinner, loosely based on this recipe from Tasting Table, was precisely what we all needed. Heat the oven to 425°. In a small bowl, stir together the cardamom, coriander, salt and pepper. 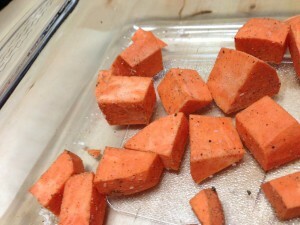 Because the sweet potato takes more time, I gave it a head start and started them alone in a glass baking dish, sprinkled with a little seasoning. Cook them for 10 minutes (I used this time to chop/prep all my other veggies). Add all the other veggies to the dish and add the seasoning to the mix. Toss well to combine. Drizzle with a TBSP of the olive oil and toss once more to combine again. 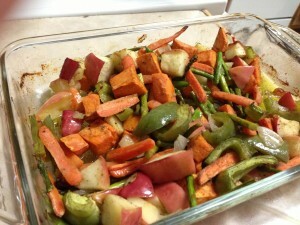 Roast for 20-30 minutes, stirring once, until the veggies are tender and the shallots begin to blacken. While the vegetables roast, cook the orzo in a saucepan on the stove-top. I like to make orzo similarly to how I would make rice. Bring 1 cup of water, the ¾ cup of stock, and 1 TBSP of olive oil to a boil. Add the orzo to the pot, stirring constantly. Bring back to a boil, reduce the heat to a simmer, and cover the pot. Simmer for 15 minutes. Remove the lid, stir once gently, and simmer another 5 minutes until all the liquid absorbs into the pasta. In a large, heavy bottomed skillet, heat the remaining olive oil over medium high heat. Crack each of the eggs into the pan. Cook each egg to desired doneness (I cooked ours over-medium), flipping as needed. Stir the veggies into the orzo. Dish into four bowls. Top each bowl with a fried egg. Enjoy! 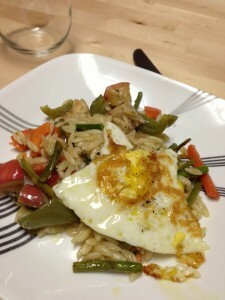 apples, asparagus, bell peppers, cardamom, carrots, coriander, eggs, leah charney, Mediterranean, Mediterranean Veggies + Olive Oil Fried Eggs, olive oil, orzo, shallots, sweet potato, vegetables, vegetarian. Bookmark the permalink. Post a comment or leave a trackback: Trackback URL.